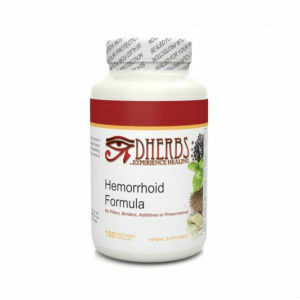 Hemorrhoid Formula is an herbal supplement that is intended to help repair damaged tissue caused by hemorrhoids, and to also help soothe it. This formula can help clean out your system and strengthen veins at the same time. Hemorrhoid Formula supports the area of the nervous system in which most of the damage occurred. Hemorrhoid Formula also can help relieve symptoms that are caused by constipation and straining, and help reduce discomfort and itching. This formula is an all-natural combination of plants and herbs that are used to soothe and repair damaged tissue, calm inflammation and reduce bleeding and some of the other symptoms that can be associated with hemorrhoids. Hemorrhoid Formula contains the following ingredients. Flaxseed-Flaxseed is a type of plant used in the treatment of Irritable bowel syndrome and stomach upset. St. John’s Wort-This is used to treat stomach upset. Aloe Vera Resin- Inhibits infections and promotes the healing of some minor burns and wounds. Horse Chestnut-Used in the treatment of hemorrhoids and diarrhea. Psyllium Husk-Pysllium Husk is used in the treatment of constipation. Dandelion- Is used by some in the treatment of upset stomach, Intestinal gas and constipation. The recommended dosage for the use of Hemorrhoid Formula by adults is: Take 3 capsules daily. For children under the age of 12, the recommended dosage is: Take 1 capsule daily. The price of one bottle of Hemorrhoid Formula is $19.95. Each bottle contains 100 vegetarian capsules. Throughout our research, we found that Hemorrhoid Formula does not come with any type of guarantee. There has to be a lot of research done when it comes to herbal hemorrhoid relief products. A surprising amount of companies put just about anything into their herbal products, feeling that more is better. However, often times, as is the case with the Hemorrhoid Formula, more is not better. John Parker	reviewed Hemorrhoid Formula	on October 22nd	 and gave it a rating of 2.